A 56-year-old man with clinically suspected coronary artery disease was referred for single heartbeat, 320-detector-row isotemporal coronary CT angiography. Using a standardized protocol1 for first-generation 320-detector-row coronary CTA,2 high-quality images of the heart were acquired in one heartbeat. These images are unique in that contrast enhancement is captured at a single point in time (isotemporal coronary CT angiography). The image in Figure 1 reveals diffuse complex plaque in the left anterior descending (LAD) coronary artery. The lesion is associated with stenosis ranging from 25 percent to 70 percent of the coronary lumen. Coronary gradients3 measure the rate of change in Hounsfield units (HU) or CT attenuation along the proximal-to-distal length of the coronary artery. 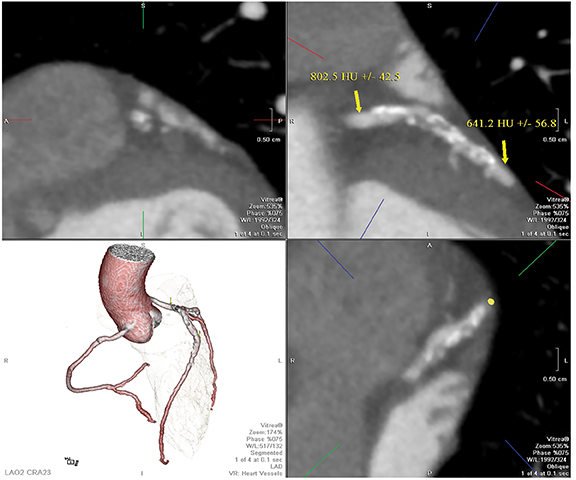 There is growing single-center evidence4 that patients imaged with isotemporal CT who have a large gradient (ie, larger than 20 HU drop per centimeter of coronary vessel) have hemodynamically significant lesions. The image in Figure 2 reveals that, using 2 regions of interest placed entirely within the LAD, the HU drop in this patient is roughly 160 HU over approximately 5 cm, or 32 HU per centimeter. These findings suggest that this lesion is hemodynamically significant. The contrast opacification in coronary CT angiography contains data on coronary blood flow that, before coronary gradients were introduced, was largely discarded. The relationship is complex and related to contrast delivery and CT data capture. 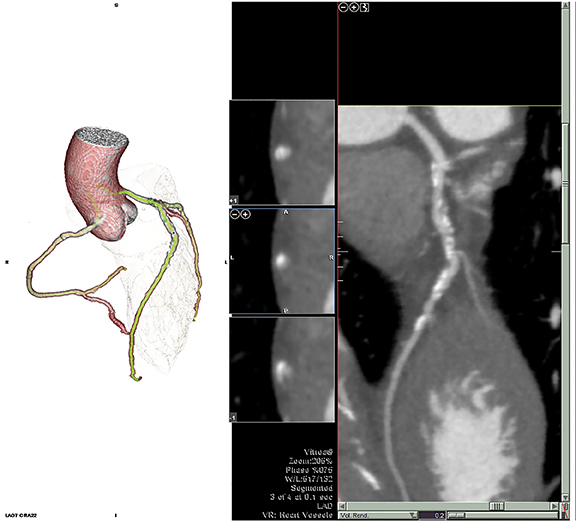 Gradient applications are likely to be less accurate with scanners that do not provide single-heartbeat acquisitions.5 The future goal of coronary CT angiography is to add metrics of physiological significance to the coronary morphology that has become the signature of cardiac CT imaging. The approach using coronary gradients can be automated6 and does not require intense computations. Coronary gradients can be used in addition to the morphology of coronary artery disease as depicted by CT angiography. New gradient methods are under development and being tested to enhance evidence that these simple metrics can be incorporated into clinical practice. Steigner ML, Otero HJ, Cai T, et al. Narrowing the phase window width in prospectively ECG-gated single heart beat 320-detector row coronary CT angiography. Intl J Cardio Imaging. 2009;25:85-90. Rybicki FJ, Otero HJ, Steigner ML, et al. Initial evaluation of coronary images from 320-detector row computed tomography. Intl J Cardio Imaging. 2008;24:535-546. Steigner MT, Mitsouras D, Whitmore AG, et al. Iodinated contrast opacification gradients in normal coronary arteries imaged with prospectively ECG-gated single heart beat 320-detector cow computed tomography. Circ Cardiov Imaging. 2010;3:179-86. Wong D, Ko BS, Cameron JD, et al. Transluminal attenuation gradient in coronary computed tomography angiography is a novel noninvasive approach to the identification of functionally significant coronary artery stenosis. J Am Coll Cardio. 2013;61:1271–1279. Berman DS, Stoebner RA, Dey D. Combined anatomy and physiology on coronary computed tomography angiography: A step or two in the right direction. J Am Coll Cardio. 2014: 63:1913–1915. Chatzizisis YS, George E, Cai T, et al. Accuracy and reproducibility of automated, standardized coronary transluminal attenuation gradient measurements. Intl J Cardiov Imaging. 2014, in press. Coronary gradients in practice: Determining the hemodynamically significant lesion. Appl Radiol. 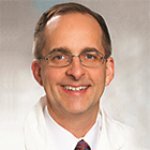 Dr. Rybicki is Director of the Applied Imaging Science Laboratory at Brigham and Women’s Hospital and Harvard Medical School, Boston, MA.